Enjoy magical sunsets from this stunning 4 bed & 4 bath coastal home designed by Jon Starr on the prestigious Manhattan Beach walk streets. This thoughtful design lends itself to stunning panoramic ocean views, making entertaining spectacular. The exquisite gourmet kitchen features Caesarstone counters, mahogany cabinets & flooring, stainless top-of-the-line appliances including oversized Sub-Zero refrigerator, Thermador professional grill & oven, Thermador microwave & Bosch dishwasher. Master Suite includes a spacious walk-in closet, wood panel ceiling, grasscloth walls, vessel sinks, steam shower, and the balcony allows for tranquil enjoyment of the ocean view. After a day at the beach, you can lounge on the walk street patio or take pleasure in the beach room with bar and Fleetwood pocketing sliders leading to a fourth bedroom/flex space. Enjoy nearby upscale dining, trendy shopping all while being minutes from LAX. Come live the endless summer of the Manhattan Beach Lifestyle. Lot Size: 0.04 Acres / 1794 Sq. Ft.
SchoolsClick map icons below to view information for schools near 216 2nd Street Manhattan Beach, CA 90266. Listing provided courtesy of Diana Harris, Douglas Elliman Of California,. Home for sale at 216 2nd Street Manhattan Beach, CA 90266. 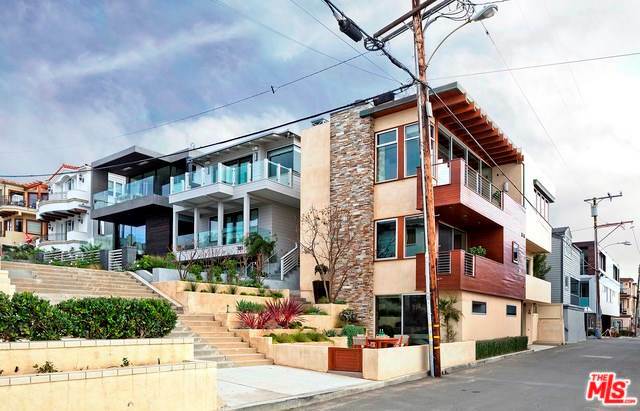 Description: The property at 216 2nd Street Manhattan Beach, CA 90266 in the subdivision with the MLS# 18405668 is currently listed for $4,400,000 and has been on the market for 165 days. You are viewing the CRMLS listing details of the home for sale at 216 2nd Street Manhattan Beach, CA 90266, which features 4 bedrooms and 4 bathrooms, and 2756 sq.ft. of living area.